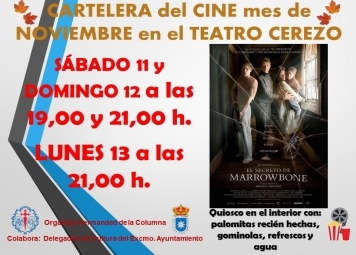 CINE: "EL SECRETO DE MARROWBONE"
* TÍTULO ORIGINAL: El secreto de Marrowbone. * DIRECTOR: Sergio G. Sánchez. * GUIÓN: Sergio G. Sánchez. * REPARTO: George MacKay, Mia Goth, Charlie Heaton, Anya Taylor-Joy, Matthew Stagg, Kyle Soller, Nicola Harrison, Tom Fisher . * PRODUCTORA: Telecinco Cinema / Lions Gate International. * PALOMITAS, GOMINOLAS, AGUA Y REFRESCOS EN EL INTERIOR DEL TEATRO.